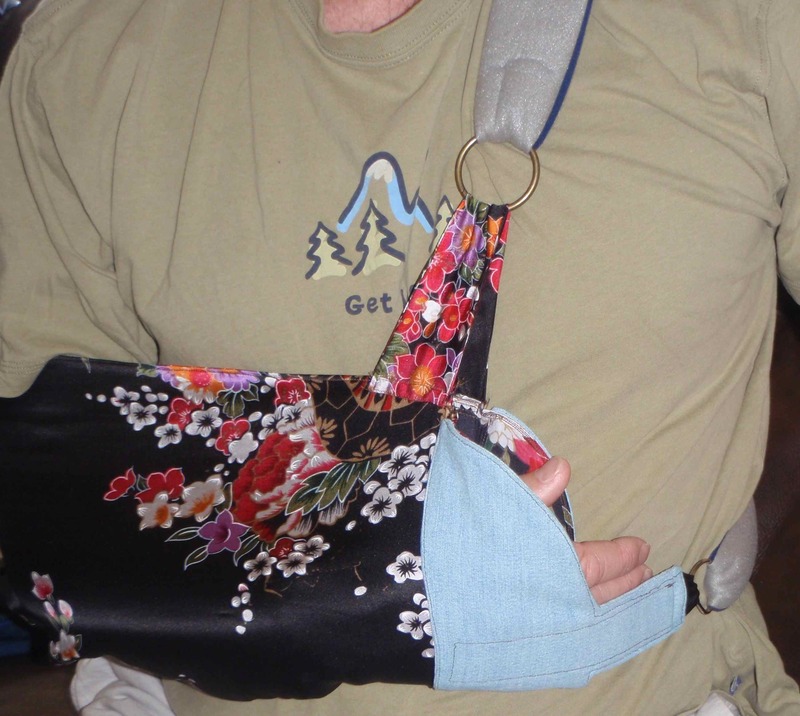 When my husband woke up a few days after surgery and said, “If there’s one thing you could do for me today to make my life better, it would be make be a more comfortable sling!” I got right to thinking. 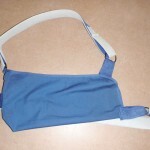 The sling that he came home from the hospital with was made of a fabric that was irritating his skin more every day. The fabric content wasn’t on the label, but it seemed to be a basic light-weight polyester. There was nothing obviously rough about it, but it was making his already painful state unbearable. I went over the properties of fabrics in my mind. Polar fleece would be soft, but hot. Knit would be soft, but too stretchy. Cotton would be soft, but might retain moisture. Silk, now that had possibilities. The trouble was that all my silk had lots of flowers on it. After a brief consultation, the man agreed that the silk would be fine. It would look fine on an evening that we might go dancing. 🙂 He suggested we just use the foam and velcro straps off of the original sling. That would make my job easier and faster. I would need to wait until after his much needed nap, though, as he has to wear it while sleeping. Then, I would make my pattern and get to work. 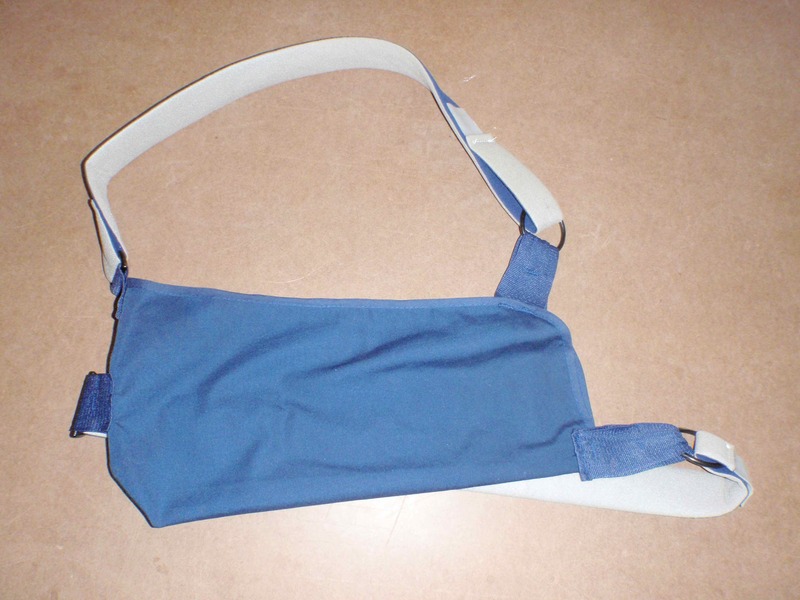 I traced the main body of the sling, which is marked as a large size. The tab at the upper elbow was the only place that wouldn’t lay flat, but I could estimate the lines. It seemed that the length of the sling was important so that the full arm would be supported, including the wrist. The only seam would be at the elbow. 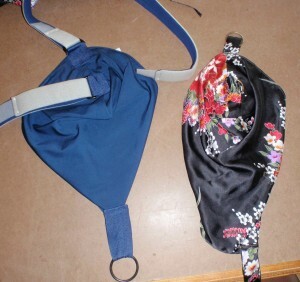 The pattern for the sling is 3 pages. 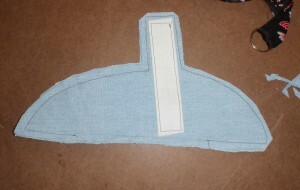 The main body took up 2 pages, but the sides can be lined up using the green squares. (you might want to double check that it is showing up and printing at 100%). The tabs on the original sling were made of webbing, which I didn’t have and didn’t want to try to sew through. I decided to cut the new tabs from silk also. I cut 2 pieces for each of the 4 tabs (see note next to pattern link) and sewed them together like the making handle sections for my bags, that is right sides together, leaving ends open for turning. 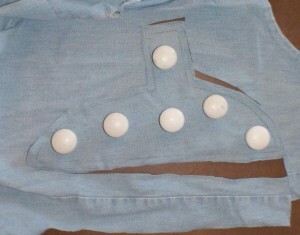 The ends would end up covered when I sewed them onto the sling. 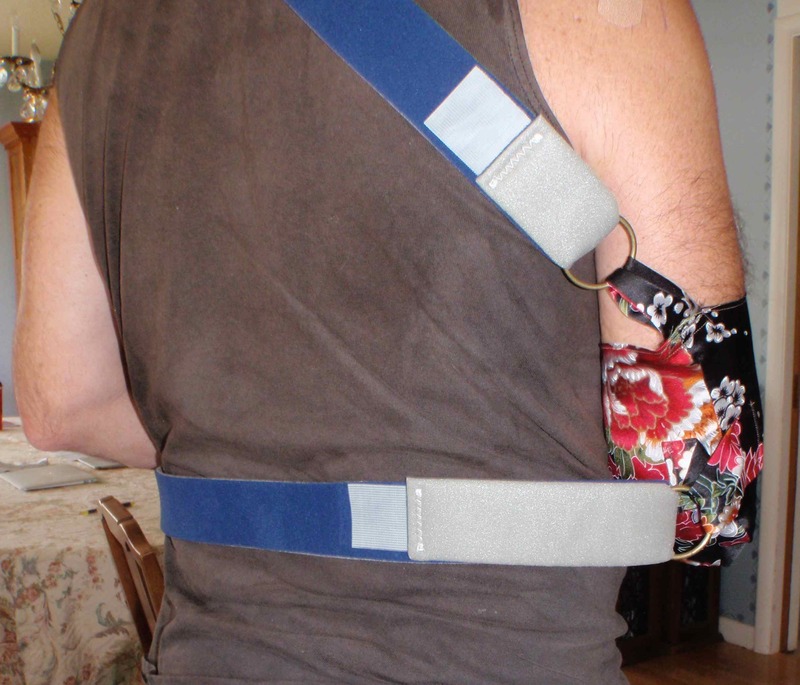 The longer tabs are for the wrist end of the sling. The shorter tabs are for the elbow end. I do not have much experience working with silk. 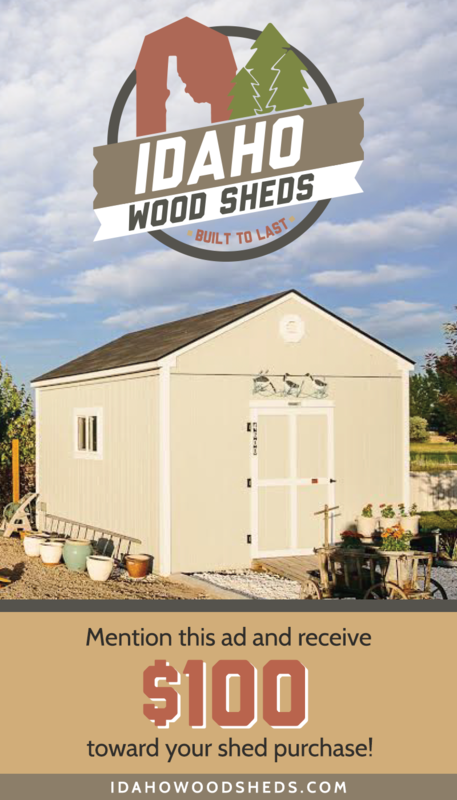 Plus, the most important thing for this project was speed of completion. I forged ahead with the thought that it would be a good chance to get a feel for working with silk without having to worry too much about it. I tried a bit of zig-zag stitch at first, but the fabric bunched to easily. 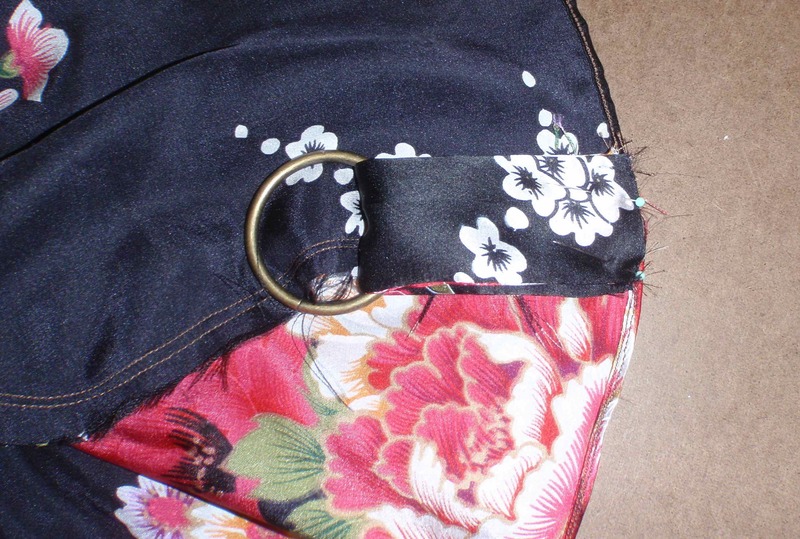 The first sewing was to hem the upper edge and wrist opening with a very narrow hem. I used the iron to set the tiny 1/8 inch fold in place. 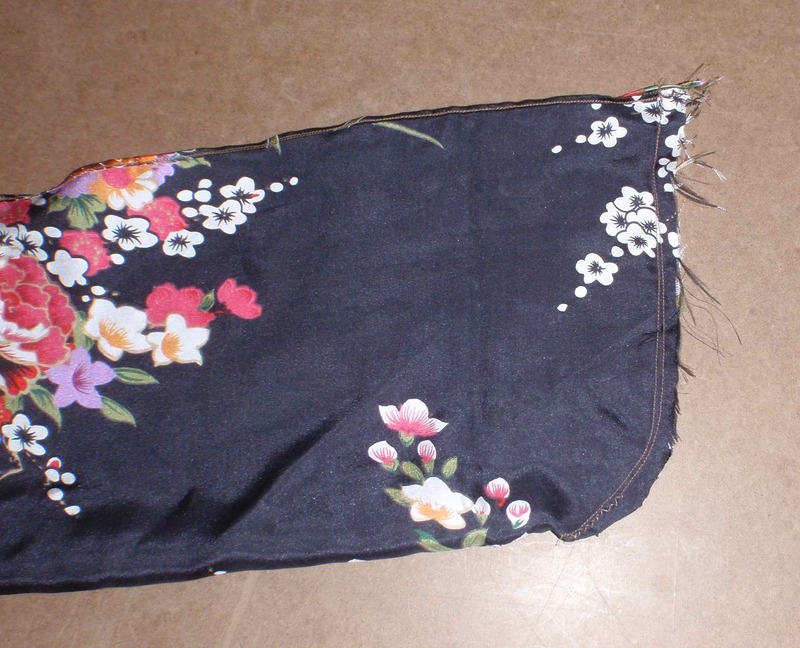 After sewing the first fold in place with a regular straight stitch, I ironed the hem over 1/8 inch again to hide the cut edge, then sewed it with a straight stitch near the inner edge. If I had been very particular about keeping the shape perfect, I probably should have used a stay stitch around the curve first. As it was, it only stretched out of shape a little bit. 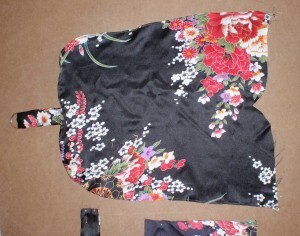 The elbow seam seemed to be best done with only a straight stitch also. I did sew over it again for strength, but I wanted to avoid any bunching from a zig-zag stitch, which happens easily on this silk without something for extra support. For putting on the tabs, it is helpful to press this seam flat. 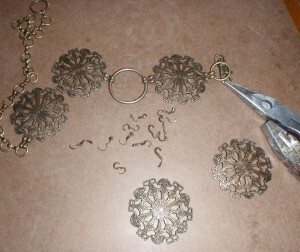 One of my biggest challenges was the rings for attaching the straps. I had a few odd sizes of D rings, but not enough. After putting one of the medium sized ones in, I looked around for other options. 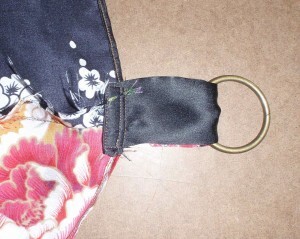 The large plastic rings that I bought for making the maya wrap baby slings, were too bulky. Anything with teeth or grippers was not acceptable. I looked around the house and found an old metal belt that I had purchased years ago, but never wear more than a few moments to decide that it doesn’t look right on me. SO! I got some pliers disassembled it to get 3 more rings, but round this time. 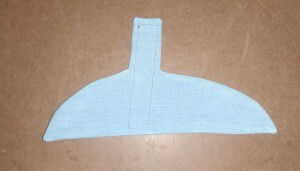 The tab for the upper elbow was threaded through a ring, then folded in half. 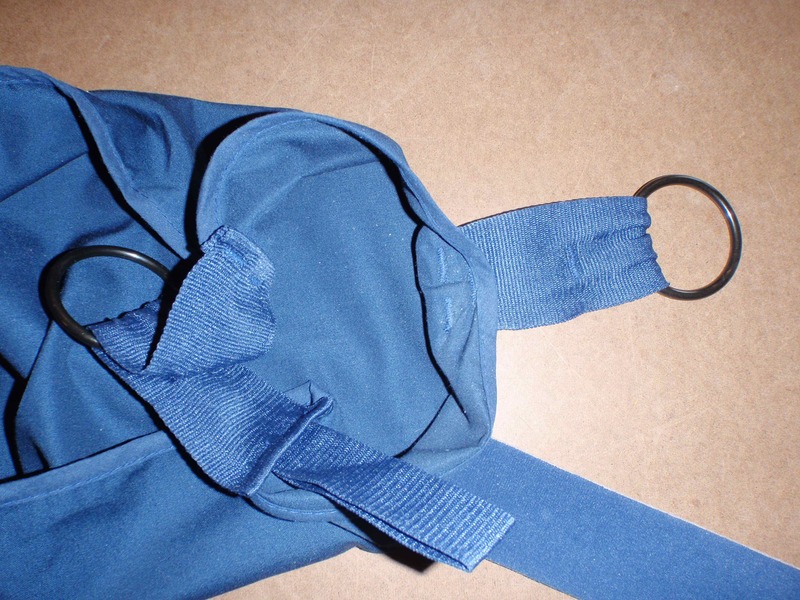 The open ends were basted together, and the same ends placed even with the hemmed edge at the seam on the inside of the sling (tab laying down into the sling). After sewing that in place about 1/4 inch from the edge, I folded it up over itself, and pinned it. This brought the tab up to the top of the elbow. Every time I did the final sewing on a tab, I did it with a box so that it would be strong. I put the tab onto the lower wrist section in a similar way, but did it from the outside instead of the inside. No particular reason. Each way worked fine. 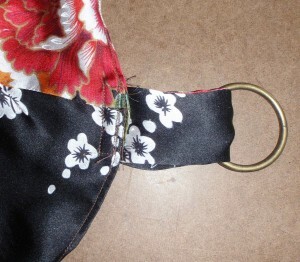 Both ways, the cut (open) ends of the tab loops ended up covered. The top of the wrist end of the sling was the trickiest place for attaching the tab. This tab needed to be sewn to each side of the sling, then sewn up near the ring so that it would stay in place. 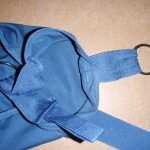 The lower elbow tab on the original sling was sewn centered over the seam, with one side of the tab anchored on each side of the seam. 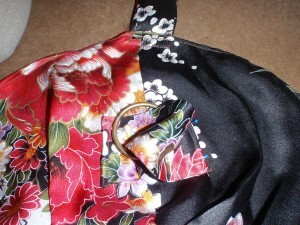 I just copied this placement on the silk sling, assuming there would be some stability to be gained from it. When my husband tried it on, he said it felt very nice. He gave us a couple of serious model poses and we went to his first physical therapy appointment. One the way out of the building afterward, we were passed by on two occasions by a 8-10 year old girls. They each looked long and hard at his sling, to the point of looking backward while walking forward. I had to be concerned they would go break their arms so they could have one, too! However, after a night of sleeping in it, it needed some adjustment. The silk tab at the lower wrist was getting pressed between his fingers and cutting off circulation. It needed to be bulked up. 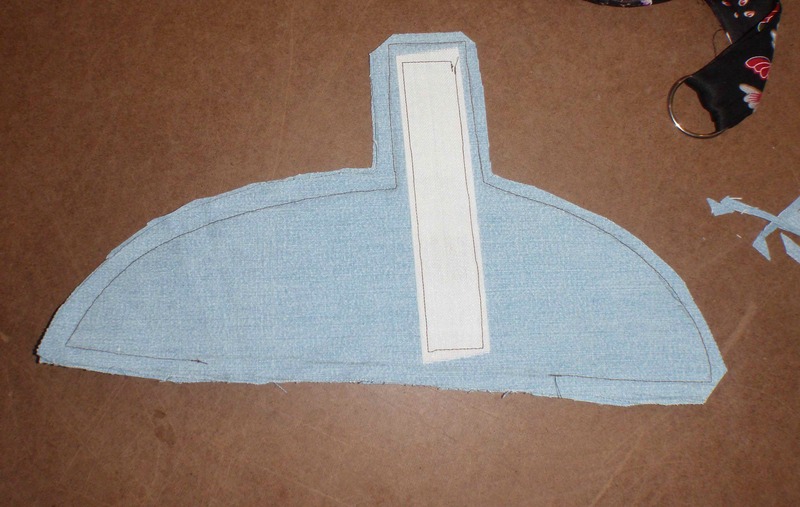 I traced the wrist edge of the sling, including around most (the denim section would end about 3/4 inch below the ring) the lower tab , onto a piece of pattern paper. 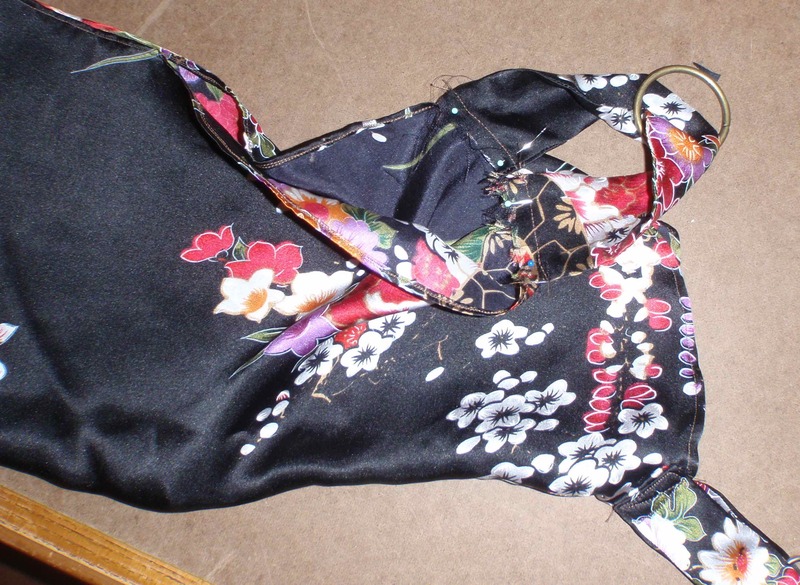 I didn’t just used the original sling pattern because I knew the silk wasn’t exactly that shape anymore. Pencil worked reasonably for this. 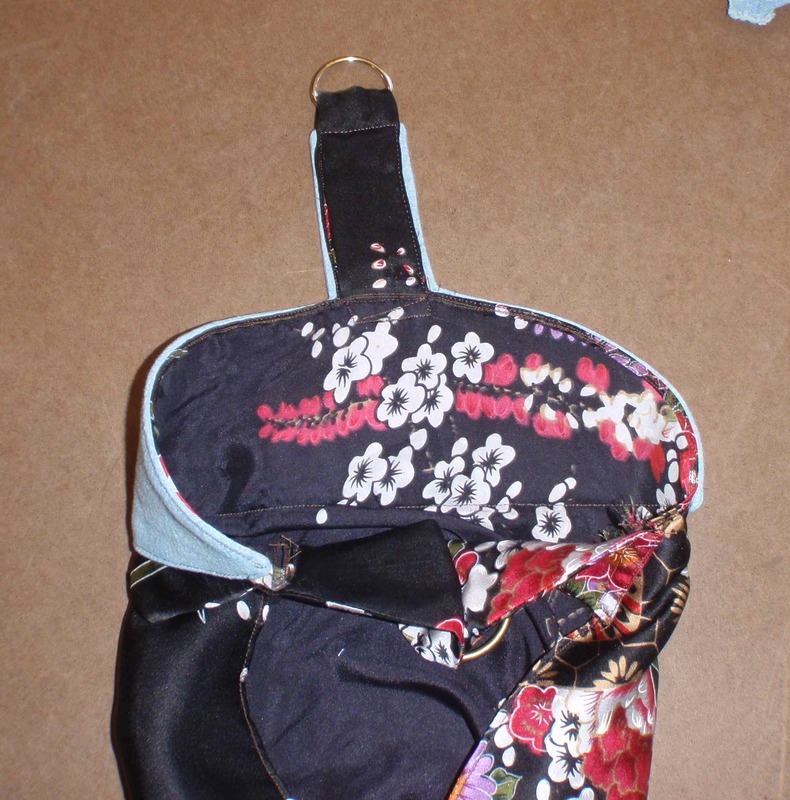 Then, I added about 3/8 all the way around for seams. Since this would only be for the very end of the sling, I drew a line so that the finished piece would not be more than 3 inches at its widest point. I cut 2 pieces this shape out of some medium weight denim. 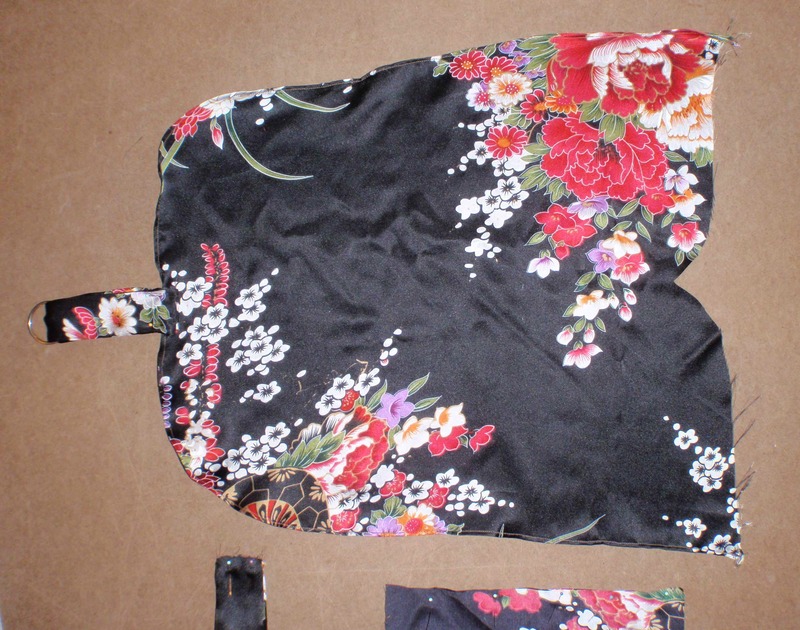 I found some stiff waist-band interfacing in my supplies and cut 2 lengths of it about double the length of the tab. This was sewn onto the wrong side of one of the new denim pieces. Then, both pieces of denim were sewn right sides together, leaving a 6 inch section on the straight edge opposite the tab open for turning. Corners were clipped, seams trimmed, and curved snipped. I turned the whole thing right side out. After some ironing to get it to lay flat, I pinned it to the outside of the silk sling, matching the tab sections. 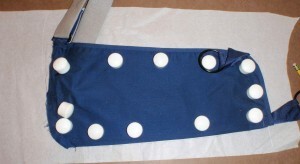 A main goal was keeping the stitching as close to the edge as possible, to avoid any folding and bumps. To be honest, I was surprised at how well it fit. I sewed the outer edge from inside the sling, the pinned the straight edge from the outside and sewed it there, since that was the easiest way to see it. 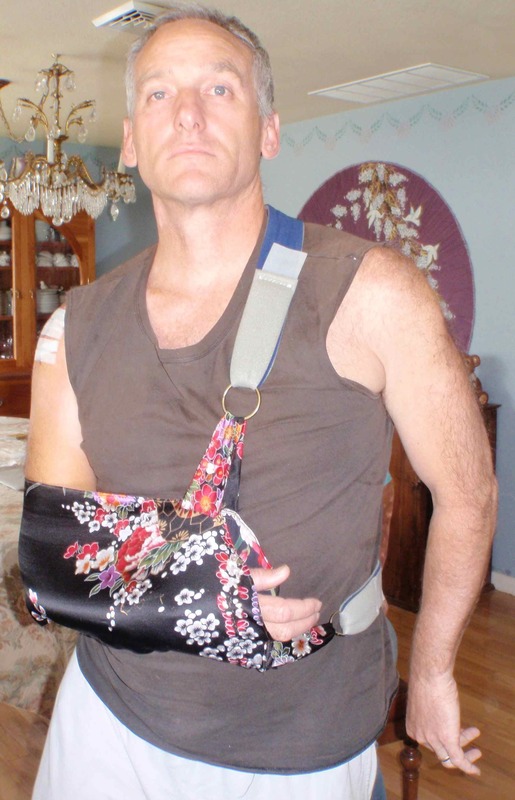 The patientis wearing it again. 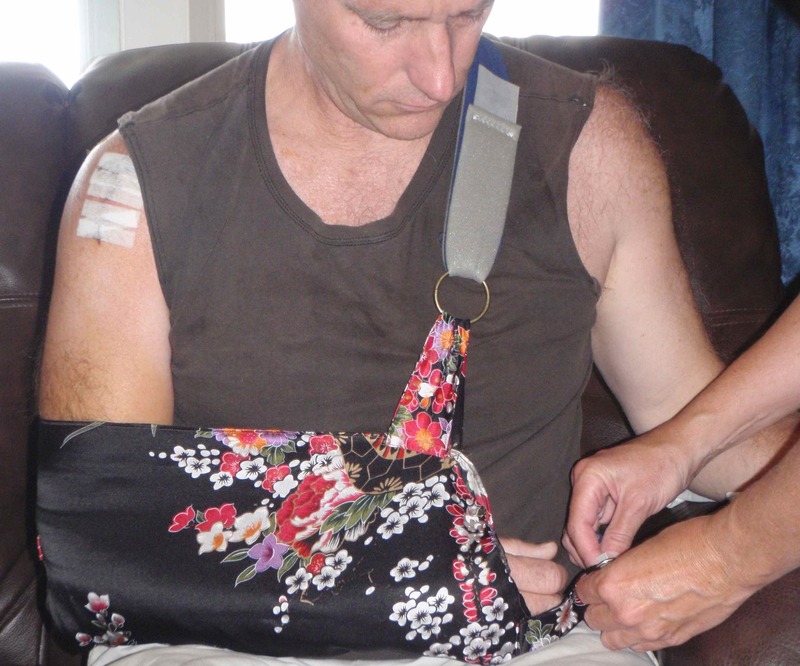 He says it is working now, although I’m not sure it is completely possible to make a sling that is comfortable when the patient is already in pain. 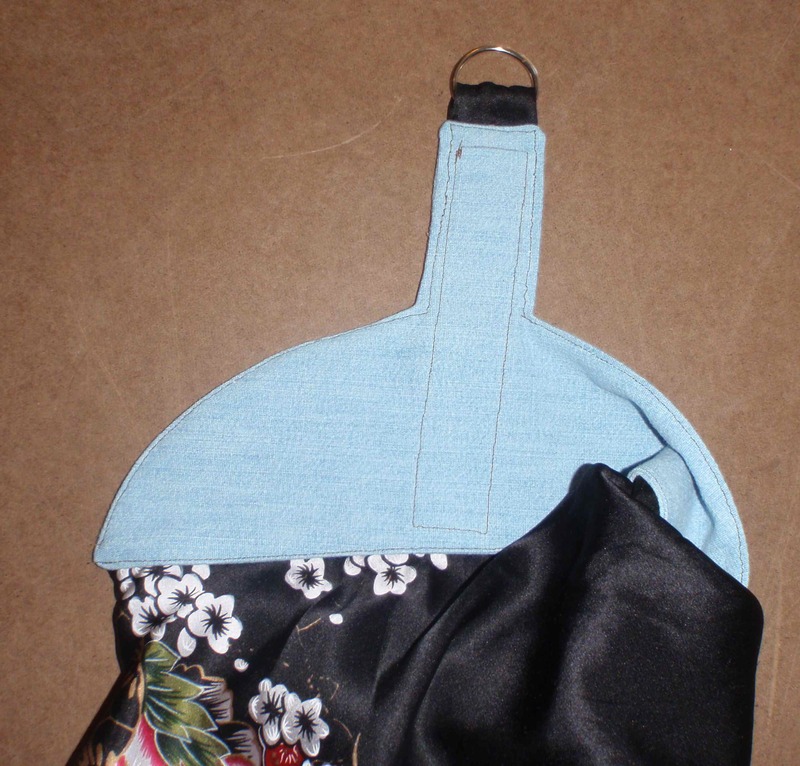 If the tab ends up being too stiff now, I will put a single layer of polar fleece just along the edge on the inside. It’s all about what the patient needs. We’ll see how he does tonight.